In a nutshell, intermittent fasting is just that: fasting intermittently. It's limiting calorie intake during certain hours/day or days/week. It's more of an eating pattern than a diet. It limits when to eat, and not so much what to eat. And that’s part of it’s appeal to people who don’t want to count calories or use their food log to track everything. Some would say that it's a more natural way to eat because humans evolved without refrigerators, drive-throughs, or 24-hour convenience stores. We now have access to food (including junk food) all day long, so eating several meals per day plus snacks may be less natural than fasting from time to time. ● Alternate day fasting-Fasting every other day. Eating one day, and then fasting the next day. This is for the more experienced and advanced as it is really challenging. It has amazing results though by those who stick to it. So I tried a few of these fasts last year. My reason was stop eating late at night (I know…terrible habit! ), to experience what an intermittent fast was, and to cleanse/detox my body so it could optimize its ability to burn fat and digest better. The late night eating was causing me digestion problems in the morning as well as sometimes I would have heartburn and acid-reflux at night, which would keep me up and also cause bloating and poor digestion the next day, which would affect my energy too. So I knew things had to change. This I what led me to learning about fasting and actually doing it. I choose to do the 16/8 for 1 day to get a good start on it. I used “snake juice” recipe by the Snake Diet guy Cole. It’s a juice that he suggests for his followers that do fasting and his Snake Diet. Of course I added digestzen essential oil to it my snake juice version to help with improving digestion. That first day was the hardest. Quite the challenge for a food lover for sure. Luckily, I had Doterra Grapefruit oil to help get me through the fast. Ingesting it with water help with improving metabolism and digestion. As well as Inhaling it from the bottle and diffusing it helps also suppress your appetite. I don’t think I would have made it through that first day without it. Join us at 5:00 pm on Tuesday in our facebook community to discover more about ways to use grapefruit for weight loss, moods & overall health, and to also find out how you can get a FREE bottle of Doterra Grapefruit oil. CLICK HERE!! The following weeks I did more of a beginner’s type of fast where I would do a 8 a.m.-8 p.m. as I didn’t really need to lose weight, just needed to improve digestion and stop that late night eating habit. *Note with Grapefruit: be cautious about grapefruit and medication contraindications. Those who are taking high blood pressure or cholesterol lowering medications should may have to avoid grapefruit. Here is a list of medications that may be contraindicated with grapefruit. CLICK HERE for complete list. Intermittent fasting can help to lose weight because it can help you to eat fewer calories and burn more calories too. Lots of people say they have success with it. But what do the studies say? According to one review study, intermittent fasting helped people to lose 3-8% of their weight over 3-24 weeks. In this study, people also lost 4-7% of their waist circumference (i.e., belly fat). Another study of 100 people with obesity showed that after a year, the people who fasted on alternate days lost more weight than people who didn’t change their eating pattern. But, (and here’s where it’s interesting) they didn’t lose any more weight than those on a calorie restricted diet. Out of the people who were to follow the intermittent fasting protocol, 38% of them dropped out. Sticking with a diet is one of the keys to weight loss success. So, if you can’t stay with a weight-loss diet, you’re less likely to lose the weight and keep it off. Intermittent fasting is not for everyone. People who are underweight, or have eating disorders or high anxiety levels and have trouble eating shouldn’t fast. Neither should women who are pregnant, trying to get pregnant, or are breastfeeding. Even I was skeptical about fasting only because I do have anxiety (which can cause me to eat less or not digest food) at times. Exactly why I did the beginners fast of 8 a.m.-8 p.m. as I felt this would be the safest so I could reap the health benefits that come with fasting, and not have to worry about losing too much weight because I already ate the amount I needed to earlier in the day. Here were my before and after photos after doing the fast for a month. Certain medical conditions can be worsened with longer periods of fasting. Also, people taking certain medications can be prone to side effects with intermittent fasting as well. One of the reasons people drop out of the intermittent fasting eating pattern is that it’s hard to stick with the fasting part. They eat more than the allowed (low-level of) calories when they’re supposed to be fasting. And when they finish fasting, they may overindulge due to the reaction of the appetite hormones and hunger drive while fasting. None of these will help with weight loss. Also, the hours and days of fasting can be very difficult. So having strong social support will be key to those intermittent periods of fasting. 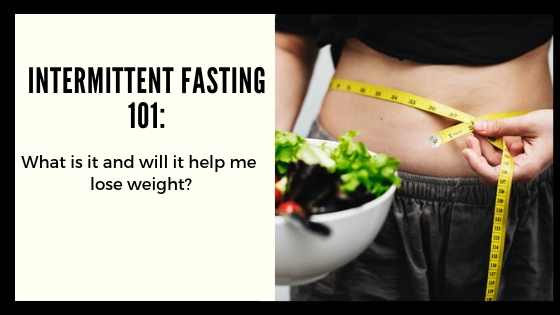 Sticking to a (healthy, nutrient-dense) weight loss diet or eating plan, combined with consistent exercise is the key to success, and intermittent fasting can be difficult for many people to stick with. Intermittent fasting is a weight loss trend that seems to work for some people. It can help to lose weight and reduce belly fat. But, it isn't safe for everyone. Many people should not try intermittent fasting because it can be risky. It can also be difficult to stick with. For the best chance of long-term weight loss success, finding a diet, or healthy eating plan you can stick with and consistently exercising is the key. Need some extra motivation to stick to your weight loss goals? Join our Facebook group for weekly health & fitness challenges, fitness tips, healthy recipes, how to use essential oils and much more! CLICK HERE!! !